Living in the shadow of three volcanos is no easy feat. The thick jungles, intense heat, and remote location provide unique challenges for the community in La Antigua, Guatemala, especially when it comes to accessing healthcare. While the country of Guatemala believes that every citizen has the universal right to healthcare, it is not always possible in such remote locations to receive the care necessary for even relatively basic procedures. 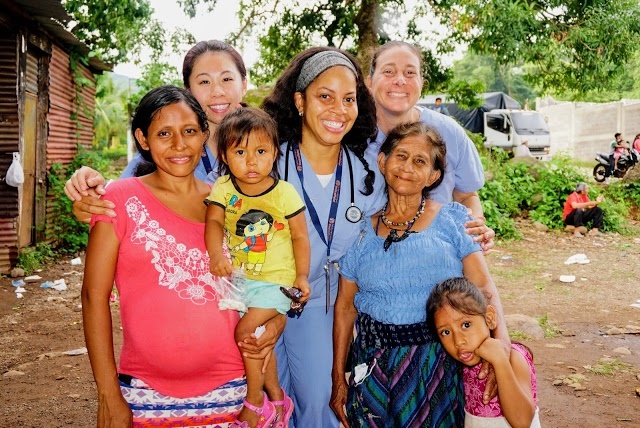 Recently the Making a Difference Foundation, in partnership with International Medical Relief (IMR), offered three physicians – Dr. Kesha Robertson, Dr. Naomi Purdy, and Dr. Luis Gonzalez – the opportunity to serve a medical mission in this region. Making a difference is at the core of what medical professionals do every day. That overwhelming passion to help people is what drew them to their profession. Though at times it can be hard to hold on to that perspective after eight years of school, internships, residency, and boards. Medical missions, like this one in Guatemala, is a way to get back in touch with the passions that drew medical professionals to this field in the first place. During the trip to Guatemala, disaster relief team provided care for various injuries -such as smoke inhalation, irritated eyes and burns – caused by a recent volcanic eruption. Over the span of the seven-day trip over 2,000 people were seen. Interacting and treating that many people in such a short time had a huge impact on all three doctors. It was small moments, like those of Dr. Purdy with the little boy, that helped them reconnect with their passion to help people. The ripple effect of their work will impact not only the 2,000 patience seen, but their families, and communities as well. We are excited to help doctors, nurses, and allied professionals meet their goals, and together we truly make a difference. I am passionate about our focus to help ignite and amplify the passions of others. Some of my passions include: making healthcare more accessible; helping providers find medical missions; playing ice hockey; reading a great book; and enjoying the amazing Utah mountains.